LUBBOCK, Texas (AP) — Texas Tech hired Matt Wells as its new football coach Thursday night after he was part of an impressive turnaround at Utah State, his alma mater. Wells had a 44-34 record in six seasons as coach of the Aggies, who are 10-2 this year and headed to their fifth bowl in that span. He was an assistant at Utah State the previous two years, going to bowls both times, including a school-record 11 wins in 2012 when he was offensive coordinator. The 45-year-old Wells replaces Kliff Kingsbury, the former Texas Tech quarterback who was fired after his third consecutive losing season and a 35-40 overall record in six seasons as head coach. The Red Raiders were 5-7 this year, losing their finale 35-24 to Baylor last Saturday with a chance to become bowl eligible. Texas Tech said Wells is bringing offensive coordinator David Yost and defensive coordinator Keith Patterson with him from Utah State. For Texas Tech fans used to big-scoring offenses, the Aggies this season are third nationally with 47.2 points a game to trail only Oklahoma and Alabama. They have an NCAA-best 24 scoring drives of under a minute. Utah State also is solid on defense, allowing only 23 points a game. The Aggies have allowed at least 30 points only three times, including their losses to then-No. 11 Michigan State in the season opener and 33-24 at then-No. 21 Boise State last week in a game for a spot in the Mountain West Conference championship game. That ended the Aggies’ 10-game winning streak. The Aggies have an NCAA-best 18 interceptions, six of them returned for touchdowns. They have also recovered 10 fumbles, and their plus-11 turnover margin is among the best in the country. Earlier this week, Wells was voted Mountain West Conference coach of the year for the second time. Wells has been a player (1993) or coach (2012-14) for all four of Utah State’s bowl wins. He was a Utah State quarterback from 1993-96. 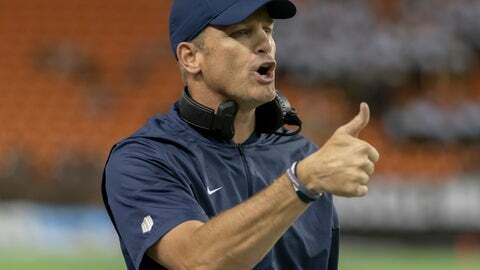 His coaching career started at Navy from 1997-01, before going to Tulsa (2002-06), New Mexico (2007-08, 2010) and Louisville (2009) until joining former head coach Gary Andersen’s staff at Utah State in 2011.